In 1976, the Forest American Legion Post No. 67 Auxiliary of Shreve presented an award of scholarship and athletic achievement to the outstanding female athlete at Triway High School. The winner of that award, Jo Anne Bly, was an outstanding four year starter for the Titans in basketball, track and volleyball. 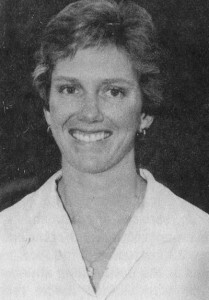 “Super Bly” as she was referred to in a newspaper article from 1976, won the Best Defensive Player award for the Titans as a freshman and sophomore. She then switched gears and was the leading scorer in the Bi-County League as a junior and senior. Her record in track was equally impressive. She gained a dozen first place finishes and several second place finishes in the sprints and high jump events at four Chippewa Conference meets. She held every individual sprint record at Triway High School at one time and was also a member of the Titan relay team which held the OHSAA state record time (49.3 seconds). Bly’s athletic prowess continued at Ohio State University where she participated on two Big Ten Championship basketball teams for the Lady Buckeyes. She ran in the 100 and 200 meter sprints, gaining first place at invitational meets at Ohio State, Indiana University and Penn State. Her most noteworthy victory came in the Twilight Relays at OSU where she defeated fellow teammate, Olympian Stephanie Hightower, by 0.2 second in the 200 meter dash. Jo Anne transferred to California State University at Long Beach in January, 1979. She played for two WCAA championship basketball teams, both of which were ranked number 5 in the final NCAA division I ratings. Despite urging from her former track coach, Mamie Rallins, who was now coaching the Olympic track team, Bly passed up the trials to concentrate on gaining her Master’s Degree and furthering her career as a basketball coach. She spent three years as Assistant Basketball Coach at San Francisco state University while attaining her Master’s Degree at California-Berkley. Bly then moved to East Carolina University as the full-time Assistant Basketball coach for the 1984-85 season. The west coast beckoned, however, and since 1985, Jo Anne has been the head basketball and softball coach at California State University at San Bernadino. She inherited the Coyote basketball team that had won only 4 of 24 games and completely turned the program around. The Lady Coyotes finished 17-9 and 14-12 in her first two seasons and this year finished with a 23-3 regular season mark. They were defeated in the NCAA division III Women’s Regional Finals at Minneapolis. She initiated the softball program at the California school and has enjoyed winning seasons in the sport. Jo Anne is also active in conducting summer basketball clinics and operates her own basketball camp. She is the Physical Education Coordinator for the Upward Bound program in southern California, and is also active with summer youth comps and programs.